Facebook confirmed to The Verge that it is testing LinkedIn-style profile tags in its usual test bed: New Zealand. Profile tags allow users or their friends to add tags to their profiles, which can be made up of words, phrases or emoji, according to The Verge. Tags submitted by friends must be approved by users before appearing. 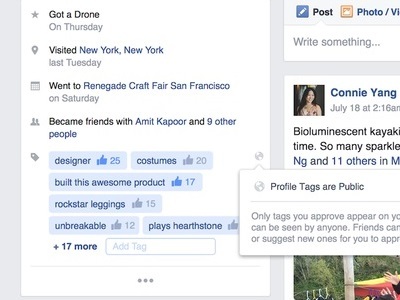 Once tags are approved, they are visible to all users, and they are listed by number of likes by friends. Readers: Would you like to see Facebook roll out profile tags? Image courtesy of The Verge, via reader Luke M.